Press junket for the film "Train to Busan" in Seoul on Tuesday. Main trailer released for the upcoming Korean movie "Train to Busan"
Let's watch the trailer on Naver TVCast too. The views already reached 1 million since released 2 days ago. Actor Gong Yoo has shown his natural charm. The July cover of fashion magazine Marie Claire featuring Gong Yoo has been revealed. In the revealed photo, Gong Yoo′s natural charm is highlighted as the setting for the photo shoot was a field of green. Gong Yoo looked to be in his natural habitat as he posed in a navy knit shirt and dark pants. An interview followed the photo shoot and when asked about his decision to star in the movie Train to Busan, Gong Yoo replied, "I was greedy to take a path that others wouldn′t. I wanted to express the character Suk Woo in a deeper level than the script showed." He continued by talking about his role in upcoming drama Goblin by saying, "I want to act as much as I want with all my body and mind." Meanwhile, Gong Yoo′s full photo spread and interview can be found on the July issue of Marie Claire and on the fashion magazine′s official website. Short clip of them introducing themselves. Watch it now. The thriller "Train to Busan" has been sold in 156 countries around the globe. Since its screening at the Cannes Film Festival in May, investors from countries including Canada, China, France and the U.S. have snapped up the theatrical rights for the film. Global pre-sales of the movie have so far grossed over US$2.5 million. Directed by Yeon Sang-ho, the film portrays a train ride with a group of zombies that carry a deadly virus. "Train to Busan" will go on release here on July 20, and in the U.S. in July and in France in August. the only zombie movie that made me cry. no wonder, how well-received the movie was. Gong Yoo.......you're the best! After going on release August 25th, YEON Sang-ho’s zombie smash TRAIN TO BUSAN took just four days to eclipse the Hong Kong box office record for a Korean film, beating the long-standing HKD 14 million figure set by romantic comedy My Sassy Girl in 2001. Local distributor Edko reported on Sunday, September 18th that after four weeks on release the film has gone over HKD 60 million (USD 7.73 million). Within a few days the film is set to overtake Arvin CHEN’s Taiwanese romance You Are the Apple of My Eye to become the highest grossing Asian release in Hong Kong history, eclipsing all other Chinese-language features. 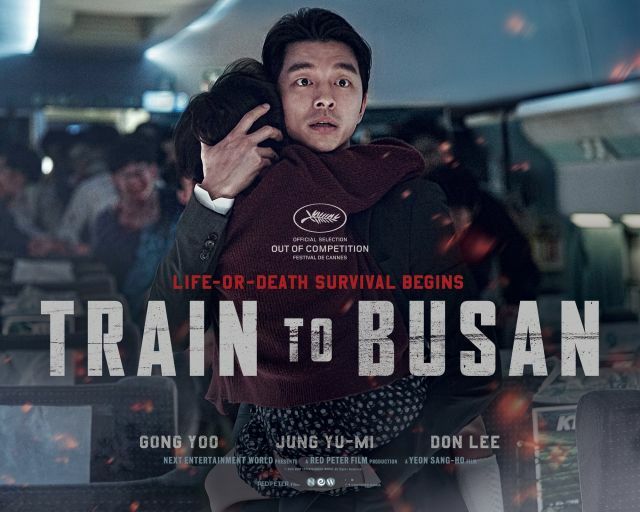 In Korea, TRAIN TO BUSAN became the highest grossing film of the year after posting the highest opening score of all time in July. It debuted to rave reviews at the Cannes Film Festival in May. The film ended up attracting 11.56 million viewers (USD 82.75 million), making it the 11th most successful Korean film of all time. Elsewhere, the film became the top scoring Korean release of all time in Singapore, where it generated USD 2.27 million and is still going strong, three times more than previous record holder 200 Pounds Beauty (2006). It performed the same feat in Malaysia, where it did so solely through previews ahead of its general release, and in Taiwan, dethroning My Sassy Girl after just two days. In addition the film has topped the box office charts in Vietnam, generated USD 1.87 million in North America, USD 1.85 million in France, USD 2.13 million in Thailand and USD 700,000 in Australia. Globally, the film has handily passed the USD 100 million mark. Ma Dong-seok to ride train to Hollywood? According to Ma‘s agency Day Dream Entertainment, a major Hollywood studio has shown interest in Ma Dong-seok and requested a meeting. Although nothing is confirmed yet, it appears that Ma’s performance in “Train to Busan” has launched him into the international limelight, which opens up many new opportunities to the actor. Fans have already speculated that Ma would assimilate very well into the Hollywood film industry, due to his American background, as well as his fluent English and his experience as a personal trainer for professional martial artists. Ma has also grabbed the attention of a large Taiwanese audience, as he was tagged as the “next new star” and was requested for a fan meeting. Korean actor Don Lee ― from "Train to Busan" ― will likely soon star in Hollywood features. Lee, also known as Ma Dong-seok in Korea, received casting offers from "major studios in Hollywood," according to Dong-A Ilbo, Wednesday. "We think it is a good opportunity (for Lee)," said Daydream Entertainment, the actor's agency. "Any following process will be processed carefully." Hollywood's interest in Lee, 45, largely stems from his role in Korea's first zombie blockbuster flick this year, which debuted in the Out of Competition category at the Cannes Film Festival in May. Following the screening, film studios including Fox, Sony and some in Europe tried to secure remake rights. "Train to Busan" also had two sold-out screenings at the 20th Fantasia International Film Festival in Montreal in August, winning the Cheval Noir trophy for best feature. The movie opened in Korean theaters in July and has sold almost 12 million tickets. "It appears Lee will become the latest addition to Korean stars who debuted in Hollywood, such as Lee Byung-hun and Bae Doo-na," an official from the Korean cinema industry said, according to the report. Lee, who moved to Korea from the U.S., where he worked as a health trainer, is known for his fluent English and machismo, which also may have appealed to Hollywood. The actor has become popular in other Asian nations. In Taiwan, the movie opened early this month and beat Hollywood's "World War Z" in ticket sales, with over $9 million worth sold in 10 days, according to the report. Lee debuted in Korea in 2005 and has appeared in movies, TV dramas and commercials. This rip-roaring, record-breaking South Korean zombies-on-a-train romp barrels along like a runaway locomotive – The Railing Dead. Owing as much to Bong Joon-ho (director of creature-feature hit The Host) as to George A Romero, Yeon Sang-ho’s breathless cinematic bullet train boasts frantic physical action, sharp social satire and ripe sentimental melodrama designed to reach into your ribcage and rip out your bleeding heart. Faster on its feet than 2004’s Dawn of the Dead remake, wittier than Pride and Prejudice and Zombiesand more thrillingly spectacular than World War Z, Train to Busan joins The Girl With All the Gifts in breathing new life into a genre that simply refuses to lie down and die. Read the full review on The Guardian. 3 pages only???? I wish that someone would upload the interviews and tell us the content since I don't understand a thing.